Enjoy the full driving experience on offer as well as Saturday night dinner at Mercure Hotel and Sunday night dinner at the Rydges Hotel. 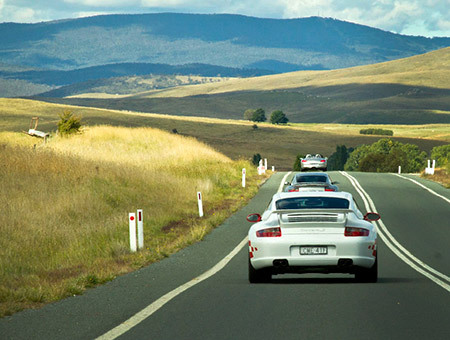 If you like driving your Porsche for long distances over interesting and well -sealed roads and enjoy the company and comradery of like- minded enthusiasts in the beautiful mid-North Coast of NSW in the springtime then this is the must weekend away for you. Saturday the drive will start at 8am on the Saturday from the Old Berowra Toll Gates (next the Herfo’s Woodshed) and drive up the M1 to Wyong exit before enjoying a pit stop at Morpeth. From there we proceed for a lunch stop at Glouster via Clarence Town and Bucketts Way. After lunch we will proceed to Port via Krambach, Nabiac, Camden Haven, before arriving via Ocean Drive. The organised 2 course Dinner (excl. beverages) on Saturday evening is at the Mercure Hotel and it is recommended that you stay here for the weekend as the Mercure has provided a Special Offer for PCNSW members & guests for this event. Sunday. Breakfast at the Mercure will get you energised for the great drive ahead. We will travel west on the Oxley Hwy, which has arguable the best, long hill-climb road in NSW – and with good tarmac. After a little over 180 kilometres travelled the sleepy town of Walcha is reached where we turn right onto Thunderbolts Way and onto our lunch stop at Uralla. Then its further north to Armidale, swinging onto Waterfall Way east to Dorrigo and down the mountain to Bellingen for a pit stop. Continuing east for about 10km, it’s then south on the A1 Pacific Hwy, which now boasts bypasses of Urunga, Nambucca Heads, Macksville and Telegraph Point since our last journey to these parts in 2015. Access to the Mercure is via Hastings River Drive, changed recently following the opening of the new highway bridge crossing the Hastings River. The Mercure Centro Hotel, Port Macquarie would like to offer the Porsche Club NSW a special accommodation rate of $167 single or $189 twin/double share room per night including full breakfast & secure hotel parking for Saturday 10th & Sunday 11th March 2018. Please mention you are from PCNSW at the time of booking for this offer which is only valid if you book before ?? It is strongly recommended you book ASAP as weekend accommodation in Port fills very quickly, particularly around this time of year. The Cost: $65 for Saturday dinner + $60 for Sunday night Dinner per person. Attendees need to organise and pay for their own accommodation , drinks, lunches and other incidentals.